Where (National) Champions Are Made !! Our Creed: SAFETY, FAIRNESS, and CAMARADERIE are our HIGHEST PRIORITIES! Come join the teams of champions! Pee Wee Cheer 2018: NATIONAL CHAMPIONS !!!!!!!!! Pee Wee Cheer 2014 : 1st Place and Best Overall Pee Wee Division at First Coast Conference Competition !! Peewee Football 2013 ; First Coast Conference Champions !! Jr. Midget Football 2013 : Southeast Regional North Runner-ups; First Coast Conference Champions !! The Jax Beach Pop Warner Little Scholars (JBPWLS) was established as a 501(c)(3) non-profit organization in 1995, when on the same day that Jacksonville, Florida won a NFL franchise and named it the Jaguars, the Jacksonville Beach Jaguars were born as the NFL granted Jacksonville Beach Pop Warner rights to use the Jaguars name and logo products. Jax Beach Pop Warner Association, and is a proud member of Pop Warner Little Scholars. We are members of the Southeast Region and one of the Associations that comprise the First Coast Conference along with Ponte Vedra, Clay County PAL, Orange Park, Fleming Island, Callahan, St. Augustine, Fernandina Beach, Yulee and Oakleaf. To participate at Jax Beach, you must live east of the Intracoastal Waterway. The eligible zip codes are 32250, 32266, 32227 and 32233 which include ares of Jacksonville Beach, Neptune Beach, Atlantic Beach and Mayport. 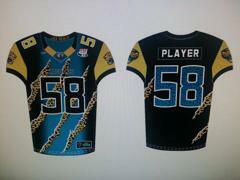 Registration is at the Wingate Park Football Field, home of YOUR JAX BEACH JAGS ! Payments in Cash, Check, Money Orders or Major Credit Cards.